LOS ANGELES -- A flight carrying the Oregon State men's basketball team from Los Angeles to Portland was delayed Saturday night after it was discovered that a woman onboard had been stung by a scorpion. The OSU team was on its way home after a 68-55 loss to USC earlier in the day. Alaska Airlines Flight 567 had to return to the gate at Los Angeles International Airport after the passenger got bit on the tarmac, according to ESPN. The woman reported being stung on the hand. She was checked by medical personnel but declined further treatment, ESPN reported. Alaska Airlines said it's unclear when the scorpion got on the plane. The plane had flown to LAX from Mexico, where scorpions are common. 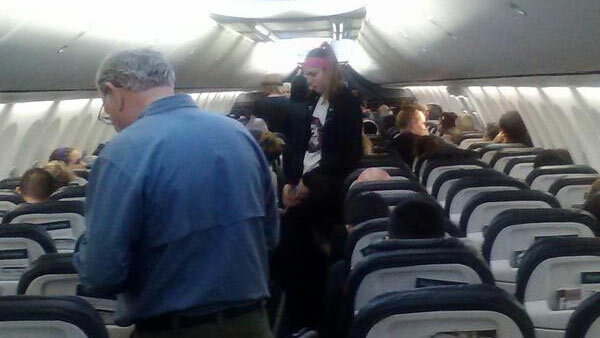 Oregon State coach Wayne Tinkle told ESPN that the woman was sitting two rows in front of him. "The plane was coming from Mexico before us, and (the scorpion) was on the plane," Tinkle said. "The woman was a real champ. She acted like it was a mosquito bite. They got it off her but the needle was stuck." Alaska Airlines said it planned to have an exterminator thoroughly check the plane once it arrived in Portland.